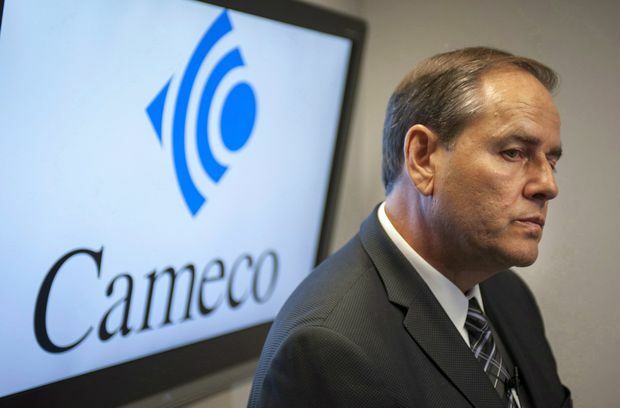 Cameco president and chief executive officer Tim Gitzel speaks with media following the company's annual general meeting in Saskatoon, in May, 2014. “You will see from our results that we had a strong finish to 2018,” chief executive Tim Gitzel said on a conference call Monday. The company relied more on stockpiles because of the mine shutdown, leaving its inventories at about a third of where they were at the start of 2018. The drop in inventories and a tough outlook will mean more challenges for next year, Mr. Gitzel said. “We continue to have reasons to be positive on the stock,” Mr. Pearce said in a note. The company reported Friday a profit of $160-million for the quarter ending Dec. 31, compared with a loss of $62-million for the same quarter a year earlier. Adjusted net earnings were $202-million, or 51 cents a share, compared with adjusted earnings of $181-million or 46 cents a share for the same quarter in 2017. The adjusted earnings were well ahead of analyst expectations of 23 cents a share for the quarter, according to Thomson Reuters Eikon. Mr. Gitzel said on the call that he has been down to Washington more times in the past six months than in the 10 years prior as the company looks to avoid tariffs or restrictions on uranium imports from Canada.